As for most home-made dishes, this Thermomix Gnocchi Recipe will add that extra-something to your meal! Gnocchi are a well-known traditional Italian food, and are common all over the world although cooked in several different versions. Like most Italian dishes, you'll find considerable variation in recipes and names from region to region: in Tuscany there are malfatti (literally "poorly made") a sort of flour, ricotta, and spinach gnocchi while Puglia prefers the cavatielli which are flour-based, and so on. The ones we all know about are potato gnocchi. Of course, making home-made gnocchi from scratch requires a bit of time, but that's where your Thermie comes in handy, to save you heaps! At my place, gnocchi are among everyone's favourite, and that makes me happy because is a reasonably light recipe: flour, water and potatoes. Plenty of fiber, minerals and vitamines! Let me know if you ever tried this recipe with a different flour, i.e. a gluten-free one. If you like you can send me your version of the recipe through this form. Place water and salt in the bowl and potatoes in the Varoma. 25 Min. 100º C Speed. 4. If you prefer, cook the potatoes in a pressure coocker or boil them in a sauce pan. Drain cooking water, dry bowl, place potatoes in bowl with a pinch of salt. 10 Sec. Speed. 4, using the spatula to mix. Add flour. 20 Sec. Speed.6. If necessary, use the spatula. Add egg and parmesan. Knead. 10 Sec. Speed. 3 to 4. Place dough on a bench, make small rolls and cut them in small bits of approx 2 cm in length, roll them alongeach one the fork prongs, then cook them in salted boiling water. If you fancy a change, add 100 gr boiled and blended spinach to the dough to make it green, or a boiled and blended beetroot to make it pink. You might also like a dressing of Champignon Mushroom Sauce. 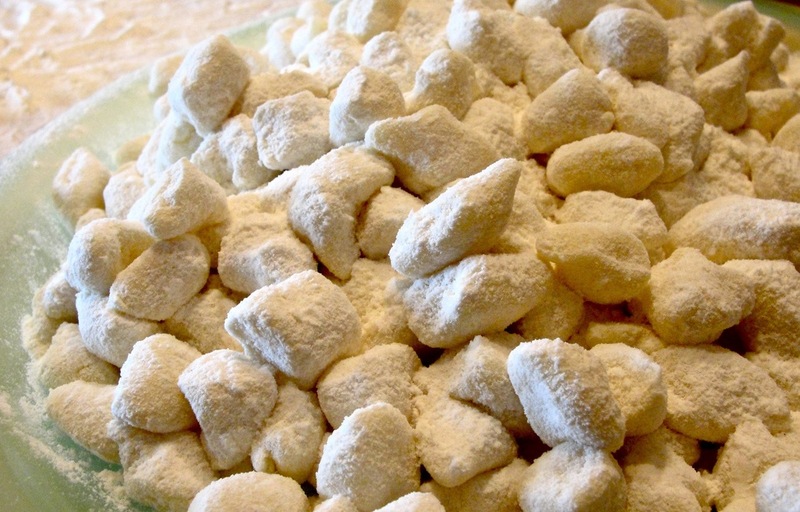 To make the best gnocchi, choose white potatoes!